Around the turn of the century (1900), Capt F. E. Lovejoy, his sons, and a few business partners, started the small, mostly family-owned Island Transportation Company to transport passengers and cargo from Whidbey Island - where they lived - to Everett and Seattle. The Island Transportation Company experienced the boom that built much of the Mosquito Fleet - land transportation was almost nonexistent. The Fleet was the main means of communication on Puget Sound during the early 1900s, just as it had been for the last few decades and would continue to be for some time to come. 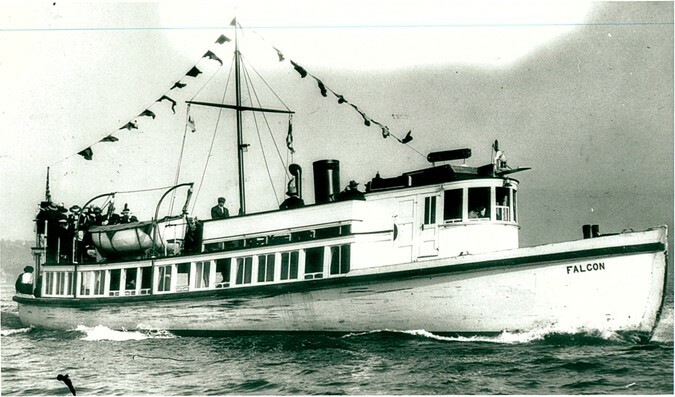 The Island Transportation Company was fast growing, and in just a couple of years, Lovejoy & Co. built and took over a number of vessels, including the Camano (which was very similar to the Falcon), Calista, Falcon and Fairhaven, and later the semi-diesel freighter Seal, and the passenger steamer Mohawk. The Falcon was built in 1908. She was designed by L. H. Coolidge, and was built at the time when coal powered steam engines had been replaced by gas, but diesels had not yet come to the ships on Puget Sound. The crew on the Island Transportation Company vessels worked long, hard days. The Falcon did not have sleeping accommodations or a galley. The crew had an early breakfast while still on land, a cold lunch with coffee heated directly on the high pressure cylinder head, and then had dinner again when they got back to port close to midnight. In 1913, the Falcon and her sister ship, Camano (who throughout her history got more attention than the Falcon and had been rebuilt and enlarged at this point in time), were sold to the Kitsap County Transportation Company (“KCTC”). The KCTC was growing rapidly at this time, and would, together with Puget Sound Navigation Company, become the two main competitors in consolidating the Mosquito Fleet. The KCTC later lost the battle to Puget Sound Navigation Company, which went on to become today's state-owned Evergreen Fleet. But in the early 1900’s, competition was fierce among the many companies, and KCTC was just beginning to shine. The Mosquito Fleet consisted of 2,500 vessels in 1913, and most of them - just as the Falcon - transported both cargo and passengers at the same time. In 1918, the Falcon's home harbor was Port Townsend, and she was still owned by the KCTC. Her sister ship, Camano, was no longer with her. 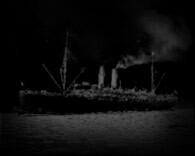 The Camano had been sunk by the steamer Sioux while at dock in Everett, raised, refitted, renamed the Tolo and then sunk again after a collision in heavy fog with the tug Magic on the Puget Sound on October 5, 1917. The later collision resulted in the death of two women passengers and a Chinese cook. The post-war era had economic repercussions on the Mosquito Fleet, and the Falcon left service with the Kitsap County Transportation Company in 1919. She was probably now too small to be profitable on Puget Sound routes. However, the Falcon was of the right size to be able to make money on Lake Washington, and it is likely that at this point, or somewhat later, she entered service on the Lake. The last part of the Falcon’s history is still covered in mist and will require further research.